a ::: b ::: c is treated as a ::: (b ::: c) . "but these are ok, val "
‘_’ have many other non-identifier uses. "while, do-while loops, not expressions"
while ((line = readLine()) == "") // This doesn’t work! "for expressions, ***big topic*** monad"
"mix-in traits rather than inherit from them"
then make it a concrete class. different parts of the class hierarchy. with its companion object and vice versa. considered members of the package itself. "The list type in Scala is covariant"
"Higher-order methods on class List"
"factory method will return a different class"
"Converting between mutable and immutable"
"Private constructors and factory methods"
"require less and provide more"
} // Cow can eat any Food ? "Currency Example is very Good !!" "Marking Rule: Only definitions marked implicit are available." target type of the conversion. One-at-a-time Rule: Only one implicit is tried. it is written, no implicits are attempted. The compiler will not change code that already works. "conversions to an expected type,"
an Ordered[T].” implicit T => Ordered[T]. "List in java is interface, but in scala is class"
in order to support pattern matching. the non-tail recursive implementation of incAll. consisting of a single generator. expressions consisting of several generators. (both with single and multiple generators). starting with an if in the for expression. collection, but with all transformers implemented lazily. you can use the force method. 1. the collection should be mutable or immutable. 2. Pick the right base traits for the collection. implicit CanBuildFrom in your class’s companion object. method called `unapply` as one of its members. val parts = str split "@"
any variables. `unapply` method returns a boolean. "return a fixed number of sub-elements in the success case." val parts = email split "@"
val input = "for -1.0 to 99 by 3"
val Decimal(sign, integerpart, decimalpart) = "-1.23"
val Decimal(sign, integerpart, decimalpart) = "1.0"
Scala uses \ and \\ instead of XPath’s / and // . 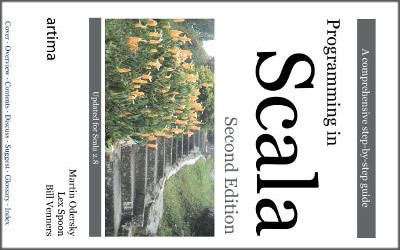 The reason is that // starts a comment in Scala! case _ => "It's something else." "Pitfall#1: Defining equals with the wrong signature"
"Pitfall#2:Changing equals without also changing hashCode"
"Pitfall#3:Defining equals in terms of mutable fields"
to a Java int to get better performance. creates a Java interface of the same name. "spreadsheet can be written in just under 200 lines"
:"add" ,"sub" ,"div" ,"mul" ,"mod" ,"sum" ,"prod"